And You Thought The ATF Interpretation On Pistol Braces Was Safe, Did You? Although I cannot disclose all of the occasions where ATF has recently reversed its prior determinations or devised a new interpretation of the law or regulation, I can disclose a recent prosecution, of a veteran, where ATF devised a new interpretation out of whole cloth and was successful in convincing the U.S. Attorney’s Office for the Northern District of Ohio to prosecute. The case is U.S. v. Wright, 3:18-CR-162 and it should have the entire Firearms Community alarmed. Although many of the documents have been sealed by the Court (that should tell you a good bit already), the superseding indictment is publicly available and suggests that Mr. Wright had an unregistered short-barrelled rifle (SBR) that was not registered in the National Firearms Registration and Transfer Record (NFRTR). Regardless of whether you believe the National Firearms Act is constitutional or appropriate, at the time of writing this article, the courts have not yet found it to be unconstitutional and if merely inappropriate, one’s proper recourse is to seek a statutory deletion or revision. Thus, the possession of an unregistered SBR is unlawful. So, why is this case concerning? Unfortunately most of the informative documents have been sealed…that is, except for the Government’s Motion in Limine. (For those who don’t know what a motion in limine is, it is a motion filed by a party which asks the court for an order or ruling limiting or preventing certain evidence from being presented during a trial). When you review the Motion in Limine, you quickly learn that the Government is seeking to preclude ATF FATD (Firearms and Ammunition Technology Division) determinations from being used in any way during trial. These determinations appear to have been part of a discovery dispute, which is also sealed and is evidenced by the Government’s statement that “[t]he Government produced the letters under the protection of a protective order that the Court authorized on August 1, 2018.”. For the reasons that follow, I find it extremely comical that the Government actually contended that “ATF FATD letters at trial creates a grave risk of confusing the issues and misleading the jury,” but I digress…for now. The critical issue in this case will not be possession, registration (or lack thereof), or barrel length. 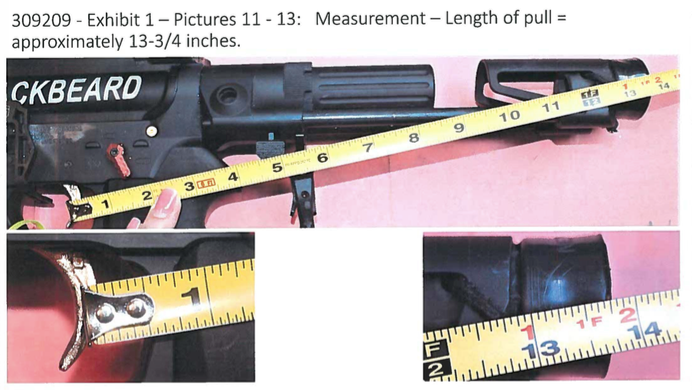 Ultimately, the primary issue in dispute at trial will be whether or not Kelland Wright’s firearm meets the definition of a “rifle,” that is a firearm designed to be fired from the shoulder, see 26 U.S.C. § 5845(a). Part of this issue will center on the implications modifications that Kelland Wright made or had made to the firearm, including the addition of an extension piece to the rear of the firearm. Wright’s expert, Richard Vasquez, is expected to testify that the extension piece functions as a cheek rest. The Government’s expert, Firearms Enforcement Officer Eve E. Eisenbise, is expected to testify that the extension piece makes the firearm designed to be fired from the shoulder. Officer Eisenbise is an employee of the ATF FATD. Richard Vasquez formerly was employed by the FATD. The relevant issues at trial relate to the specifics of Wright’s firearm, an AR pistol platform that was modified with an angled foregrip and collapsible stock. Now, everything starts to come into light. The Government is contending that an extension piece that is designed as a cheek rest is actually a stock or if not, Mr. Wright had a vertical foregrip on his pistol. (We call this roping a heifer, where the Government attempts to contend that no matter how you classify the situation, you have violated some law). Now, some of you are probably saying, hold on, ATF previously issued determinations – such as in relation to the Thorsden determination request letter and ATF’s response – that cheek rests and other devices, which were not designed to be shouldered, are not stocks. (For more discussion on cheek weld determinations, see our blog article Ringing In the New Year ATF Style). And they have issued numerous determinations – such as the one regarding the Magpul Angled Fore-Grip – that angled foregrips are not vertical pistol grips. Yep, but that didn’t stop the ATF and the U.S Attorney’s Office from prosecuting Mr. Wright and seeking to preclude the jurors from seeing or hearing of the determination letters, even though, the Government never once contended that Mr. Wright actually shouldered the cheek weld extension or utilized the angled foregrip. So the DoJ is revising by practice their determination that the stabilizer braces aren’t an NFA item, or more correctly, the weapons to which they are attached are an SBR. I’m not certain whether he had an angled foregrip or a vertical one, and it should make no difference. Fortunately, this was an instance of jury nullification and Mr. Wright was found innocent. But the cloak has been pulled back and you see the future. It looks stupid. PLANO (CBSDFW.COM) – A decorated Vietnam War hero from Plano is going to prison for a crime he committed decades ago. Alfred Pick was sentenced by federal judge District Judge Marcia A. Crone to seven years in prison for a mistake he made nearly 40 years ago — buying a fully automatic gun that’s illegal for citizens to own. The rifle was similar to the one Pick had in the Army where he served as a lieutenant. Pick lived in Plano’s Air Park neighborhood along with other pilots who enjoy a runway right outside their homes. The 70-year-old Vietnam veteran even served as the president of his homeowners association. Thus, when the ATF raided his home last year it came as a shock to friends like Mark Shackelford. “He’s always been a good person to me,” Shackelford said. Shackelford learned later that authorities were looking for and seized an M14 rifle that Pick had bought at a Fort Worth gun show in the early eighties. “He was a gun collector and it was probably the piece de resistance of his collection… he had shown it to me. I’ve never seen it taken it out of the case,” said Shackelford. The raid and arrest on Pick’s Plano home came two weeks after his wife of 40 years died of cancer. They were using marijuana, which authorities found and added another criminal charge. Friends of the vet showed up to support him after he pleaded guilty in a Plano federal courtroom and was sentenced to 87 months in prison by a judge. More than 40 years ago, Pick was awarded the military’s third highest honor, the Silver Star, after more than 100 combat missions and for a short time he was a POW. Factors that his friends and attorney say should have led to a lighter sentence. “The man is a Silver Star winner, he saved lives, he took care of his wife, he’s been in custody for a year, I would think that when a man turned 70 and is an American hero you don’t destroy the rest of his life for one mistake,” said Shackelford. Some Vietnam vets in Plano were not as sympathetic. They said Pick should’ve known better especially since the serial number on the rifle was scratched out. I say auto-sear rather than machine gun because the only difference between this and the one that you perhaps have in your gun safe if a small piece of metal called an auto-sear. Hey, he can have one if he’s doing his killing for the FedGov. If not, he’s just a peasant. As for those other Vietnam Vets who weren’t sympathetic, they still belong working go FedGov. That’s where their heart is, so why consort with the peasants? As for the ATF, boy, I’m glad sure they are Johnny on the spot. I feel better and safer that they have this guy behind bars. I’m just glad they went home safe at the end of their shift. Judicial Watch announced today that it filed a Freedom of Information Act (FOIA) lawsuit against the Bureau of Alcohol, Tobacco, Firearms, and Explosives (ATF), a component of the Department of Justice, for 1,900 pages of records about a proposed reclassification that would effectively ban certain types of AR-15 ammunition as armor-piercing (Judicial Watch v. U.S. Department of Justice (No. 1:18-cv-02218)). Judicial Watch filed the lawsuit after the agency failed to respond to a May 14, 2018, FOIA request for the 1,900 documents about the Obama administration’s AR-15 ammo ban efforts. The documents include ATF talking points about the “Armor Piercing Ammunition Notice of Proposed Rulemaking” and other records discussing ammunition classification. The lawsuit is the latest development in Judicial Watch’s more than three-year effort to obtain documents from the ATF. Judicial Watch discovered the document cache in separate litigation on the ammo ban issue. In March 2015, more than 200 members of Congress wrote to former ATF Director B. Todd Jones to express their “serious concern” that the proposal to reclassify the ammunition types as armor-piercing may violate the Second Amendment by restricting ammunition that had been primarily used for “sporting purposes.” The ATF’s move “does not comport with the letter or spirit of the law and will interfere with Second Amendment rights by disrupting the market for ammunition that law abiding Americans use for sporting and other legitimate purposes,” the letter said. The ATF subsequently halted its efforts. To begin with, civilians should have access to everything the military has, including armor-piercing ammunition, under our second amendment rights and duties. Second, M855 (“Green Tip”) is not armor piercing ammunition. That’s enough said. If I have to say any more about that, I may as well try to teach calculus to my dog – I’ll probably have more success and I’m sure a more receptive audience. Tom Fitton and Judicial Watch is doing Yeoman’s work on just about everything imaginable. I’m on their email list and see what they’re engaged in, and I simply can’t link it all, and I certainly can’t intelligently comment on it all. If you’re not on their distribution, you need to get on it right of way. As I said before, most of the ATF employees were there under Holder and at least complicit in the abuse of American citizens. That’s who they are, it’s the way they think. Tom had to push this hard for success because what’s in the collection of documents is embarrassing to the ATF. You can count on it. And also as I’ve said before, for me (who cannot afford to file a lawsuit every time I turn around), the FOIA is essentially worthless. The FedGov has ignored virtually every one of my requests (I’ve had success only once). The power of the purse is what the Congress has over the heads of the bureaucratic tyrants. They won’t use it. Thus there is no check on their power. Curiously, the go-to guy AP went to for ATF input was retired agent Bernard Zapor, who made the profitability of smuggling guns south of the border sound lucrative enough to make AP’s case for them. The guy knows something about gun smuggling—he was in charge of the St. Paul Field Division when “Operation Fearless” resulted in an agent’s guns and a machine gun being stolen. I highly doubt that this would have been their only choice. I suspect that there are current ATF agents who want to see this as a pretext for the disarming of Americans. After all, most of the AT F employees who were with that abominable organization during the Holder years are still there. The spirits of Obama and Holder speak from the grave through the current statists among the FedGov. What has changed? Besides a political position ordered by superiors who would not be qualified to intern at the Firearms Technology Branch…? Of course, nothing has changed, including the lack of integrity of the FedGov who cares not about officially approved lies and inconsistency. From the comments there is this gem from someone named Dave Brown. OK, when the pistol arm brace first came out we all said, better get one before they change their mind. WE all said the same thing when they said The Bump was OK. Get one before they change their mind. Me, I don’t need one as I have a few firearms I can bump without adding a stock, but even Bumping is considered a no no. As for Bump Stocks, they should never have been allowed, and you all know it. So quit being a Complainer, ask them to make a special Stamp for The Bump, and pay the price. Of course, that’s true if you don’t believe in the second amendment. 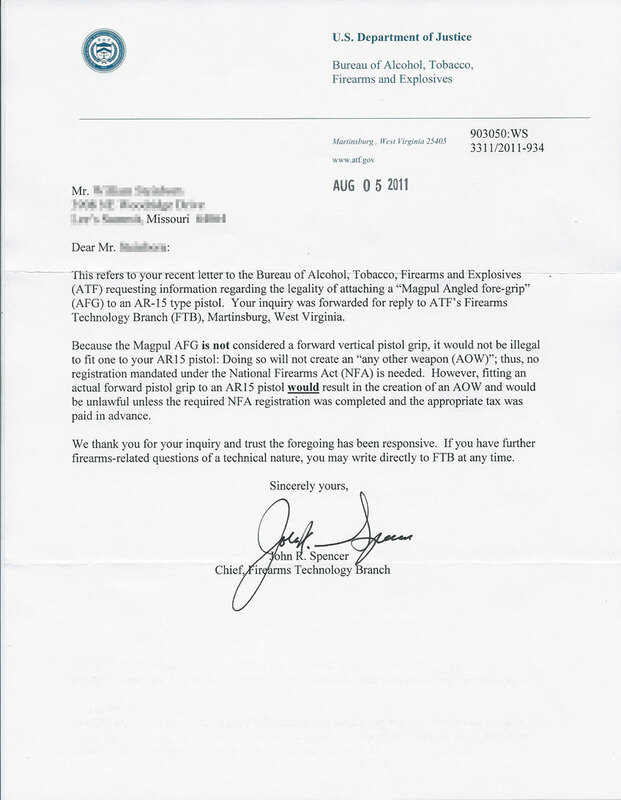 James Wesley Rawles at Survival Blog has done a simply magnificent job of upbraiding the ATF. It’s an absolute throw-down of blood and gore and broken bones when Rawles gets through with the ATF. If you like seeing the FedGov slapped around, visit Survival Blog. Here is a taste. 1.) To declare existing privately owned devices contraband machineguns with no available method of registering them as machineguns constitutes an uncompensated taking. 2.) To declare existing privately owned devices contraband machineguns with no Grandfather Clause flies in the face of many decades of Federal case law, under Federal Jurisprudence. This also constitutes an uncompensated taking. 3.) The proposed redefinition of “machinegun” (per 26 U.S.C. 5845(b)) is vaguely worded. For example: What is meant by “function of the trigger”? Does that mean a trigger pull (only)? Does that mean a trigger release? Does that mean a pull OR release of a trigger? Or does that mean a pull AND release of a trigger? Does a partial pull of a trigger still constitute a function? Or must a pull of a trigger be through its entire arc to a stopping point to constitute a function? Or must a pull of a trigger be through its entire arc to a stopping point and then a release to a reset point to constitute a function? Or does a release of a trigger from a stopping point to a reset point to constitute a function? Or does a release of a trigger from a partially-pulled position to a reset point to constitute a function? 4.) More than a mere interpretation, it REDEFINES, AMPLIFIES and EXPANDS the wording of the NFA-’34 (26 U.S.C. 5845(b)). This is clearly bureaucratic overreach by the Executive Branch. Per the Constitution, only congress can MAKE laws. The executive branch and agencies can only ENFORCE already legislated and duly enacted laws. 5.) How can the BATFE redefine the meaning of the phrase “single function of the trigger” (per 26 U.S.C. 5845(b)) without the consent of congress? 6.) How can the BATFE further restrict the possession of Militia Weapons without a modification or repeal of the 2nd Amendment? 8.) By declaring a previously legal and constitutionally-protected “arm” suddenly “illegal” and “contraband” and mandating its surrender to authorities would IDENTIFY the owner is thus a violation of the 5th Amendment protection from self-incrimination. It would also violate the 5th Amendment’s “taking” clause. 9.) By declaring a previously legal and constitutionally-protected “arm” suddenly “illegal” and “contraband” and mandating its surrender to authorities would violate the 4th Amendment protection from seizure without due process. 10.) I take exception to this wording: “Because such devices allow a shooter of a semiautomatic firearm to initiate a continuous firing cycle”. That is vague. 12.) I take exception to this wording: “…these devices convert…” It is not a conversion to the operating mechanism. Rather, it is either an adjunct or a firing technique, or both. 13.) I take exception to this wording: “…these devices convert an otherwise semiautomatic firearm into a machinegun.” By your new definition, then so does holding your your thumb in your belt-loop when firing from the hip! 14.) 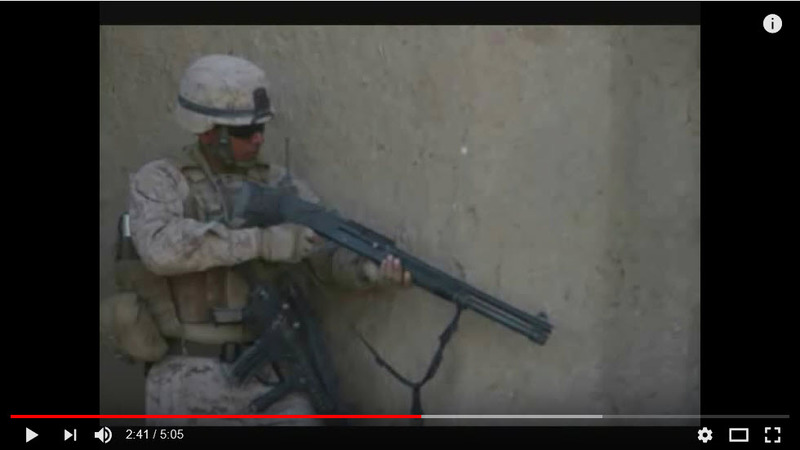 I take exception to this wording: “…these devices convert an otherwise semiautomatic firearm into a machinegun.” By your new definition, then so does holding the buttstock of a rifle a short distance from your shoulder when firing! 16.) I take exception to this wording: “harnesses the recoil energy of the semiautomatic firearm in a manner that allows the trigger to reset and continue firing without additional physical manipulation of the trigger by the shooter.” The reset IS indeed physical manipulation of the trigger by the shooter because BOTH the shooter’s body (including the trigger finger) and the gun itself (including the trigger itself) are in motion, when under the force of recoil. 17.) I take exception to this wording: “Hence, a semiautomatic firearm to which a bump-stock-type device is attached is able to produce automatic fire with a single pull of the trigger.” It is NOT automatic fire, as defined by congress in NFA-’34. 18.) I take exception to this wording: “Hence, a semiautomatic firearm to which a bump-stock-type device is attached is able to produce automatic fire with a single pull of the trigger.” It is not producing automatic fire. The shooter’s trigger finger is still producing the fire, one shot at a time. 19.) I take exception to this wording: “With limited exceptions, primarily as to government agencies, the GCA makes it unlawful for any person to transfer or possess a machinegun unless it was lawfully possessed prior to the effective date of the statute.” The Hughes Amendment to FOPA restricts only machineguns, not semi-automatics. Only congress can redefine the word “machinegun”. 20.) I take exception to this wording: “Consequently, current possessors of these devices would be required to surrender them, destroy them, or otherwise render them permanently inoperable upon the effective date of the final rule.” To “surrender them, destroy them, or otherwise render them permanently inoperable” would constitute an uncompensated “taking” which is not allowable under Federal jurisprudence. James goes on through number 42. It’s just a bloodbath, frankly. He’s not a lawyer and clearly much smarter than anyone who works with the DoJ or ATF. Closer to home, our own Fred Tippens writes the ATF with the following. I have yet to come to terms with writing again. They clearly didn’t engage what I wrote earlier and have no intention of engaging my points in the future. I will point out one more thing about this ban. The GOP establishment is clearly very good at playing the long game. Trump won, but the GOP establishment is burning the place down, not Trump. There was no logical or necessary reason to pack the Omnibus bill with spending for Planned Parenthood or for the CDC to issue gun control studies. They have cut his support from two main constituencies:  right to life, and  gun rights. Trump cannot win again without those two constituencies. I’ve already heard folks in both camps tell me that they won’t vote for Trump again if hell freezes over. Among pro-life workers (I know some) there was great sadness over the monies given to PP. Thus the GOP has done two things it wanted to do. They’ve got their gun control to run on in the next election without having to vote on it themselves (they are cowards). They got the ATF to do the dishonest work for them. Second, they have ensured that Trump is a one-term president. As I said, it is the GOP establishment and not Trump who is burning the place down.